Vodafone will sell the handset "soon"
Vodafone UK has confirmed that it will sell the Huawei P30 Lite in the UK. The announcement from the mobile network reads: "The new Huawei P30 lite is coming soon to Vodafone UK. Customers will be able to purchase the new device on Vodafone's Red Entertainment plans which include a choice of Amazon Prime Video, Sky Sports Mobile TV, Spotify Premium or a NOW TV Entertainment Pass." While Vodafone says the P30 Lite will be with us "soon", there's no firm release date just yet, but we do know all about the handset as it's already launched in other countries around the world. 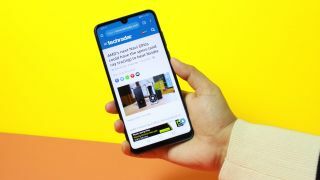 The Huawei P30 Lite comes in below its namesakes - the flagship P30 Pro and P30 - with a still-large 6.15-inch Full HD display, mid-range Kirin 710 chipset and a triple camera setup which doesn't reach the same heights as its siblings. Those three cameras consist of a 24MP main sensor, 2MP depth sensor (for portrait mode shots with a blurred background) and an 8MP ultra-wide sensor, allowing you to cram more of your scene into each shot. Round the front you get a 32MP camera, which is the same as the selfie snapper on the P30 and P30 Pro. There's also a 3,340mAh battery, Android 9 and a headphone jack on the base of the handset which sits alongside a USB-C port and speaker. We also don't know what the Huawei P30 Lite price will be in the UK, but a rough conversion from the UAE price (where it's already on sale) puts it at around £230. We'll keep you updated with all the latest information when we get it.